I like most of the Betty Crocker packet mixes. They are always tasty and so quick and easy to make. The Blondie White chocolate mix is a particular favourite with my daughter so I often buy it for her. I tried these not so long ago for the very first time and I was not left disappointed. They were so moorish I wish I purchased a second packet. Betty Crocker white chocolate cake mix is an amazing and delicious mix that is so easy to use and great for family poppping over.so good! I tried these blondies last week and they are incredibly delicious. Full of white chocolate flavour which is one of my favourites. Lovely texture and melts in your mouth after a little while. I am buying this product again in this week’s next shop. betty crocker mixes,these browines are so yummy and easy to make they have a crunch to the edges and a perfect softness. Blondies are just so incredibly divine and I love them. This blondie mix by Betty Crocker is so super and easy to make and the taste is unbelievable. Quite yummy, but could be more of it! Again, as with all things cake mix you definitely don’t get as much for your money. however, for convenience sake I love to use these and Betty Crocker does make yummy tasting products that usually turn out perfectly. I tried these a couple of camping trips ago as something different from the traditional chocolate brownies and they taste great- not really sure which I prefer both are good! This is one of my go to cake mixes when I need to bake something quickly for the kids. Very easy, one bowl mixing. So easy the kids can do it themselves. 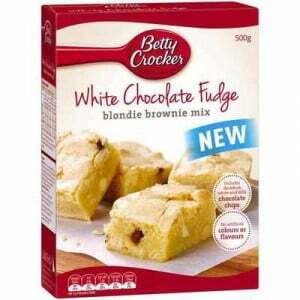 How would you rate Betty Crocker Cake Mix Blondie White Choc? Yoplait le rice classic vanilla.